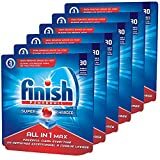 Best Dishwasher Tablets in India – Top 5 best including Fortune, Finish, Fairy and Crystale - Top 10 In India - Only The Best of everything! LATEST product list, updates regularly! Choosing the best dishwasher tablet seems to be a simple enough job, but it actually isn’t. How different can one dishwasher tablet be from another... that's what you may be tempted to think! But you'll be surprised by how much difference the right dishwasher tablet can make to the results. You will be quite wrong to think that most dishwasher tablets are more or less the same. In fact there are dishwasher tablets that are better at removing oil stains, those that work better in higher temperatures and those that are ideal for hard water. You may already know this but germs in used dishes and cutlery get removed and destroyed when the water is at around 60 degrees celsius. This temperature is easily achieved in dishwashers, but you cannot hand wash dishes at such a high temperature as it will scald the skin. Hand washing of dishes can happen at most at round 48 degrees celsius, and people can bear that hot water only for a few minutes. Since the dishwashers will work best at higher temperatures, it is important for the dishwasher tablets to be most effective at these temperatures. Dishwashers also use seven times less water as compared to washing by hand. If you haven't yet bought a dishwasher then you should have a look at India's best dishwashers here. All these factors need to be taken into consideration while buying a dishwasher tablet. However one of the biggest considerations is the savings you can have by choosing the right tablet and the right quantity of the dishwasher tablet. Though the tendency is to always g inf or the cheapest option, when it comes to dishwasher tablets, it really makes sense to check which pack will give you the best value. If you buy a 100 tablets together then you will end up saving much more than if you buy a pack of 6. Also in some surveys and studies done about dishwasher tablets, it has been found that some of the most expensive ones and some lower price dishwasher tablets have almost the same washing power and abilities. So, it will make much more sense to choose the lower cost dishwasher tablets and buy for a longer period of time, to make considerable monthly savings. we have created special tables with each dishwasher tablet brand that gives you a way to choose the most value packed pack for your needs. have a look at the best dishwasher tablets listed below and look at the tables to get the best deal. Let us get into what actually a dishwasher tablet is made of and why it cleans dishes well. Essentially, a dishwasher tablet is made up of two kinds of enzymes that help in breaking down the food and cleaning it off. The proteases in dishwasher tablets go and attack the proteins, like milk, eat, egg yolk, cheese and others. The amylases go and break down the carbs. The basic use of the enzymes is to immediately start breaking down the stains that have got encrusted so that a longer soak period is not needed. When the dishwasher tablet has the right balance of enzymes along with the other chemical elements that help to clean the dishwasher itself and give it a longer life. These include water softeners and anti corrosion elements. Dishwasher tablets also contain something known as builders, consisting of carbonates, silicates and citrates. These builders have the funstion of tackling the herdness of water, as hard water causes dishes and glasses to look dull. The important part of the dishwasher tablets is the breaking down of food molecules by the enzymes. 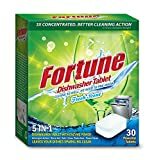 The best dishwasher tablets available in India are available on websites like Amazon, which have all the best brands including Fortune, Finish, Crystale and others. Let us have a look at what dishwasher tablets are the best and how to get good results for the least expense. The ranking of the dishwasher tablets below is not according to popularity, instead it is according to the cleaning power and value for money. Dishwashers in India have the added requirement of dealing with typical Indian cooking which is oily. Using the recommended dishwasher tablets, detergents, salts and additional accessories is fine, but intelligently choosing the right brand of dishwasher tablet will make the real difference. We have researched several authority comparisons, read reviews extensively and compared with professional tests ranking dishwasher tablets, to reach these conclusions. Across multiple surveys done on the best dishwasher tablets, the Fairy Platinum has come out on top. These tablets are not only excellent at cleaning the dishes without the need of any other additional additives to the dishwasher but they also keep your dishwasher in ship shape. The result of using Fairy Platinum dishwasher tablets is that all of your utensils, glasses and cutlery is washed clean perfectly, without a trace of grease or stain. With these tablets you can literally cook anything that you like knowing that your dishes and utensils will be sparkling clean after putting into the dishwasher. With these tablets in your dishwasher even the most stubborn stains, grimiest tea and coffee stains, and crusted food is effectively and perfectly removed and cleaned. The only drawback is its price. 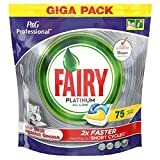 These Fairy Platinum tablets are priced higher than the other dishwasher tablets, but their cleaning power and results are definitely superior. It is no wonder that the Fairy Platinum dishwasher tablets have been ranked No. 1 in the maximum number of tests and rankings. In fact they not only clean your dishes to a sparkling newness, they also clean the dishwasher and make is interiors and pipes and components, shiny and new every time. They are the very best when it comes to cleaning grease. Finish is a well known name in dishwasher tablets and detergents. It is one of the most popular worldwide and for good reason as finish dishwasher tablets are one of the best around. Rated amongst the best in all tests and rankings, Finish has the brand value and overall goodwill of thousands across the world. The best rated Finish dishwasher tablet is the Finish all-in-one Max Powerball. This highly rated tablet has the additional red ball visible on the tablet that gives it maximum cleaning power. Finish has been developed to give a brilliant sparkle to everything that is being washed. The powerball washes away residue and gives a real shine to everything. Along with exemplary cleaning and a shine, it also protects glass against corrosion and scratches, so that they stay in perfect condition wash after wash. The Finish all-in-one Max Powerball promises 10 actions. They actions include the washing away all residue to leave everything shining brilliantly; a powerful salt and rinse aid action that washes spots and film away so thoroughly that everything is left spotlessly clean; a built-in salt function that tackles water that is soft, medium and slightly hard; the powerful pre-soaking solution also makes a big difference. Since the water is very hard in many places in India, it is recommended to use Finish salt. In effect finish all-in-one Max Powerball is a supercharged solution that will completely take care of all your dish washing needs and leave you with sparkling clean dishes, cutlery and glasses every time. Another advantage of Finish is that it comes in a re-sealable bag, which means that you can just take out a tablet and reseal the pack, so no need for unwrapping individual tablets. If you want to go green then your best choice will be ecover dishwasher tablets. They are environment friendly, and have been made from biodegradable components including plant and vegetable compounds. ecover dishwasher tablets consistently come out in the top 3 bets in tests and rankings, and with their environment friendly composition it is one of our favourites. Their cleaning is very good, but a premium dishwasher tablet like Finish may score higher overall. Ecover dishwasher tablets are plant based and have mineral ingredients. They are phosphate free and also fish friendly. That means they will get naturally absorbed into nature and the environment without causing any harm. Ecover products are never tested on animals, and are made in their clean and and green factories. These tablets are certified to be environment friendly and the packaging is made from recycled cardboard. This brand is very sincere and environment conscious. We give it full marks and also feel it is a great choice for all of us and the planet. Ecover claims to power away stuck on food and encrusted food with its carefully selected ingredients. It has performed very well on most tests and has earned rave reviews from users around the world. The biggest advantage of the Fortune dishwasher tablets is their price. Since they are not imported, these tablets have much lower manufacturing cost that has been extended to the customers. When you compare the results of a Fortune dishwasher tablet and a Finish dishwasher tablet then the Finish does a much better job, however Finish Dishwasher tablets cost much more than Fortune. Fortune tablets claim to have 5 in 1 benefits, that include detergent action, rinse aid, salt, glass protection and power clean. This means that you do not need to pre wash utensils and also do not need to use rinse aid. However, with Fortune dishwasher tablets it is advised to use rinse aid otherwise some amount of wetness gets left behind on utensils after the wash cycle. A quick round up of its benefits will include these - it has a 5-in-1 action which does most things and removes the need to prewash your utensils. It has special glass protection that prevents scratches or corrosion on your glassware, including wine glasses and other kinds of glasses. The power of the tablets infused with enzymes removes the toughest of food stains by breaking down the food molecules. The Fortune tablet dissolves completely during the wash cycle, which is an important point. It also removes stubborn food smells from dishes. It has a fresh scent. Fortune also claims to work best for Indian style of cooking with more oils being used. Thus we can say that it has been formulated for Indian conditions. With Fortune dishwasher tablets it gets down to your own personal choice. Going by reviews, Fortune is by far the most popular and clearly the best selling dishwasher tablet brand in India. We feel that you should go in for Fortune if you are looking for solid value and decent cleaning results. 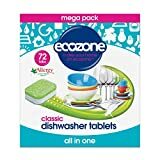 Ecozone dishwasher tablets are a good choice, and deliver good value for money. Ecozone has been specially formulated to tackle grease and grime and transform your dirty dishes and glasses into sparkling new ones with a wash cycle. Ecozone dishwasher tablets fight marks and stains from water and ensures that everything is left with a dazzling shine. The Ecozone formula breaks down even the most stubborn dried and baked on food. As its name suggests it is completely vegan and cruelty free. It is also an allergy free product as per UK standards. Though it is a very good option, its cleaning power may not score as high as the best dishwasher tablets featured in this list. Active enzymes that help removal of stains from the dishes / utensils.